Houghton Mifflin Harcourt, 9780618224562, 304pp. This new collection -- returning faithfully to the original Danish -- takes Andersen out of the nursery and places him squarely in the literary pantheon. While Hans Christian Andersen's tales continue to seize the imagination with their singular blend of simplicity, eccentricity, and charm, readers have had to content themselves with inaccurate retellings and inadequate translations. Now Diana Crone Frank, a Danish novelist and linguist, and Jeffrey Frank, a novelist and editor at The New Yorker, offer a much-needed modern translation, brought out by Andersen's original American publisher. 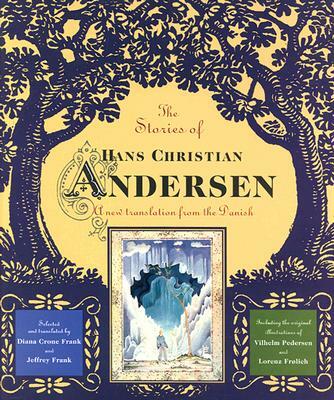 In this collection are twenty-two tales that best represent Andersen's literary legacy. Here are the classics: "The Little Mermaid," "The Ugly Duckling," "Thumbelisa," and "The Princess on the Pea" among them, as well as largely unfamiliar stories like "By the Outermost Sea." Illuminating notes clarify references in the stories. And in an extended introductory essay, the Franks explore the writer and his times, placing the enigmatic and often bizarre figure of Andersen among his literary contemporaries, such as Charles Dickens and Srren Kierkegaard, with whom he crossed paths. Illustrated with the delicate and beautiful drawings that accompanied the original Danish publication, The Stories of Hans Christian Andersen is sure to delight readers of all ages. Jeffrey Frank is a senior editor at the New Yorker and was formerly an editor at the Washington Post and the Washington Star. He lives in Manhattan with his wife, Diana. "Adults and children alike need the actual Andersen, here made brilliantly available by the Franks." --Harold Bloom, editor of Stories and Poems for Extremely Intelligent Children of All Ages.